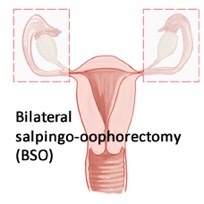 What is a Laparoscopic Bilateral Salpingo-Oophorectomy? are at high risk for ovarian cancer. have certain types of breast cancer. have certain types of ovarian masses or cysts. In the operating room, you will be given general anaesthesia. A catheter may be inserted into your bladder to drain urine and to monitor the amount of urine coming out during surgery. The catheter will stay in until the next day. Compression stockings will be placed on your legs to prevent blood clots in your legs and lungs during surgery. After laparoscopic removal your ovaries and fallopian tubes will be sent to the pathologists where a pathologist will look at them under a microscope. The results of the pathological examination should be available within two weeks after surgery. When surgery is finished, small dressings will be placed over your cuts.